MIDDAS recently carried out laboratory sound insulation testing, in accordance with BS EN ISO 10140-1:2016 & BS EN ISO 10140-2: 2010, at The Building Research Establishment (BRE) – the world’s leading building science centre. 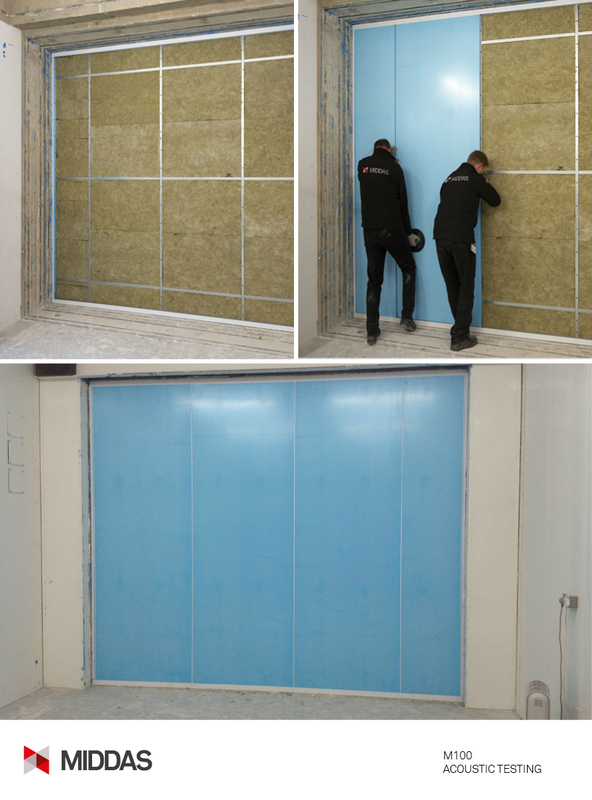 Over a two-day intensive testing programme, the M100 solid partition wall was put through its paces in the acoustic testing laboratory at BRE, with nine separate configurations squeezed into the available test time. Results ranged from 40dB Rw for the 100mm, uninsulated-cavity system, to 58dB Rw for the 200mm, insulated-cavity system incorporating the newly developed lightweight, split-stud. The standard 100mm, 60minute fire rated version of the M100 system, with insulated-cavity achieved 47dB Rw with the 200mm, 120minute fire rated product wowing us all at 55dB Rw. Another great result came from the 100mm M100 with new lightweight stud and low density, insulated-cavity option, breaking through the 50 mark at 51dB Rw. Further testing is scheduled for February 2019 with the focus switching to the glazed iterations of the M100 system.